Granola is a delicious and satisfying breakfast and is simple to make at home. Serve with skimmed milk or fat-free yogurt. 1. Preheat the oven to 150°C, gas mark 2. Place the honey, oil and 3 tbsp water in a small pan and heat together until runny and well blended. 2. Place the nuts, seeds and oats in a large bowl and pour over the honey mixture, stirring until evenly coated. 3. Spread the mixture out onto two large, parchment-lined baking sheets and bake for 30-40 minutes, stirring once or twice, until dark golden. Stir in the berry mix and leave to cool completely. 4. Break up any large clumps and pour the granola into a large airtight container. Will keep for up to three weeks. 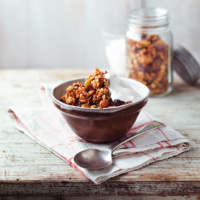 Try varying the dried fruit you use to include your favourites. Chopped ready-to-eat apricots and mango work really well in this recipe, as do LOVE Life goji berries. This recipe was first published in Fri Jan 02 15:30:00 GMT 2015.